PT Pembangunan Jaya Ancol along with Jakarta Social Dept. is holding National Children's Day at the Color of Kingdom Stage - Dunia Fantasi (Dufan) Indoor Area, Ancol, North Jakarta, Thursday (9/6).
" This is a form of concern for children that we do every year"
It is participated by 500 people consisting of street children, abandoned children, children with disabilities, and children from underprivileged families under Jakarta Social Dept. 's Social Institution. "This is a form of concern for children that we do every year," said C. Paul Tehusijarana, President Director of PT Pembangunan Jaya Ancol, Thursday (9/6). 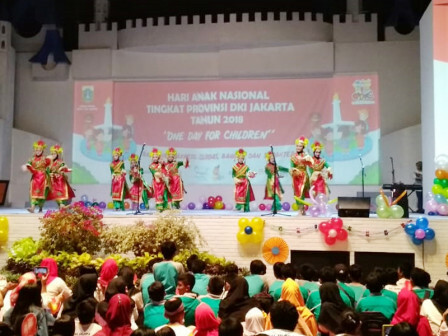 The event takes theme "I Am a Child of Jakarta, Smart, Happiness and Prosperity". Besides enjoying free entertainment and recreation in Dufan, they also performed "Lenggang Nyai"dance to welcome the arrival of the Jakarta Governor, Anies Baswedan. In this occasion, his party wants to provide facilities and opportunities for children to actualize themselves while enjoying Ancol rides for free. "Our hope is this event can meet one of the children's rights, namely the right to recreation," he stated.